I’ve always loved garden nasturtiums in my flower beds. But there are many other ways that these fairly common plants can be a great addition to your vegetable garden. Companion planting is a method of planting plants together so that they benefit each other in some ways. Some enrich the soil and others attract attract beneficial insects, repel bad guys, or trick the bad guys with scent disguise. Nasturtiums fit nicely into the companion plant category by attracting hover flies, which will destroy aphids on your prize roses or in your vegetable garden. 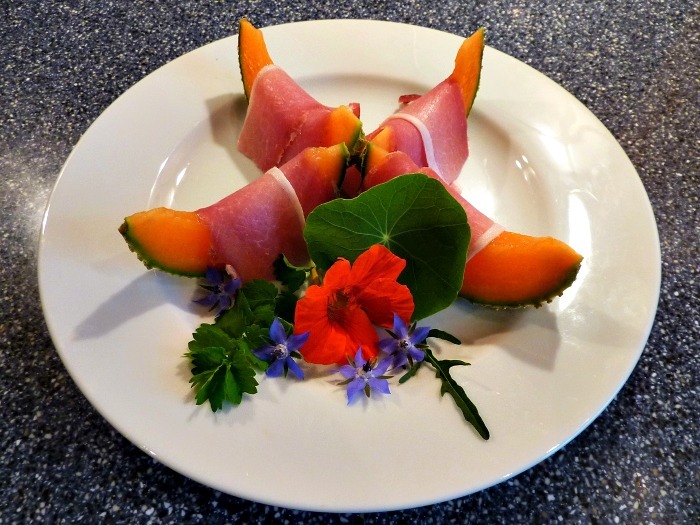 Another unknown fact about nasturtiums is that they are edible. You may not see them sold in the grocery store as food, but nasturtiums are used as a peppery addition to salads and sandwiches right along with dandelions, purslane, borage, and other greens. They’re beautiful as a garnish and contain oodles of vitamin C.
Herb spreads can be made with a combination of mayonnaise and the herbs of your choice such as nasturtium flowers. A common spread recipe is 1-2 TBSP of mayonnaise with an equal amount of nasturtium petals, spread on toasted rye bread. Nasturtium seeds can be used as a substitute for capers, as well. Just pick the nasturtium seeds while they’re still green and haven’t hardened. Put them in a glass bottle or jar and cover them with vinegar. You can use them after three days of them soaking in the vinegar and they don’t need refrigeration. My favorite use of Nasturtium flowers is to soak them in sugar water and then put them into a glass of champagne. The fizziness of the champagne releases a bit of the flavor and is just delightful. Nasturtiums are very easy to plant which makes them ideal for kids because the seeds are easy to handle and almost always germinate. 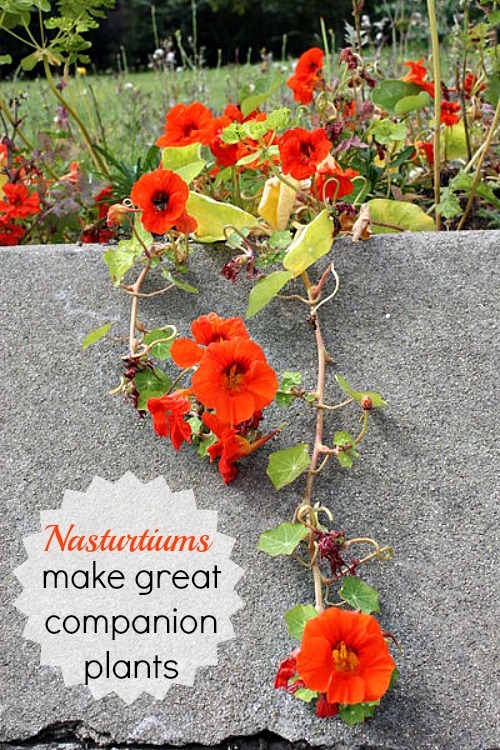 You can choose climbing, dwarf, trailing, or traditional nasturtium varieties. They do well in nearly every zone and come in both single and double flowers. Garden nasturtiums bloom in creamy white, red, red-brown, orange, yellow, and maroon. They prefer sandy soils, but do fine anywhere as long as it’s a well-draining area. Usually the poorer a soil is, the more flowers you’ll get. Full sun to part shade is the best exposure for nasturtiums. 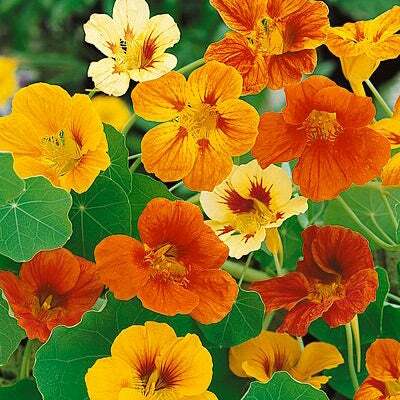 Plant nasturtiums in the early spring and by June you’ll have blossoms for salads. Plant them and don’t be a snob. American Meadows has a great dwarf nasturtium mix Dwarf Nasturtium Seeds Tom Thumb Mix. This compact Nasturtium grows into a 8 to 12 tall mound with flowers in shades of red dark orange light orange yellow and dark red. Use in beds and borders or as a sunny ground cover. It is an Annual. Click the picture below to purchase the seed mix. For more gardening ideas please visit my Pinterest Gardening Boards.